Dr. Dolce was raised in San Antonio, where he swam and played water polo for John Marshall HS. He continued athletics through college and completed his undergraduate studies at Texas Christian University in Fort Worth. He then attended the University of Texas Medical School at Houston before completing his orthopaedic surgery residency at Georgetown University Hospital in Washington, DC. 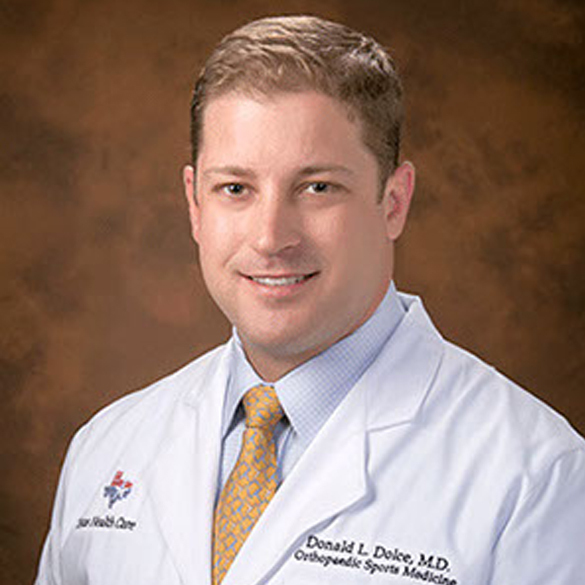 After residency, he completed a sports medicine and arthroscopy fellowship at the Houston Methodist Hospital. While in Houston, he worked as an assistant team physician for the Houston Texans, Rockets, Astros, Dynamo, Rice University football and baseball, and the Houston Rodeo. His past and current research interests include MLB pitching mechanics and their relation to injury risk, clinical ballet and biomechanical FAI hip studies, and biomechanical meniscal transplantation research. Dr. Dolce is currently an assistant team physician for TCU athletics and is a team physician for Nolan Catholic High School. Hand (N Y). 2014 December;9(4):511-5.